Shaw is one of the leading manufacturers of vinyl flooring, along with Mannington and Armstrong. 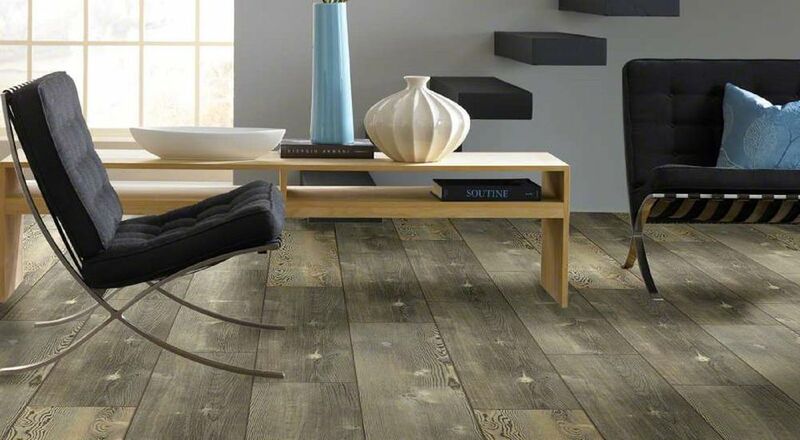 Shaw currently offers several different collections of luxury vinyl plank floors, and each includes a range of colors and/or effects, such as simulated wood. Like many of the major luxury vinyl plank manufacturers, Shaw is continually changing up its lines. In some cases, new lines are introduced and are prominently featured. Other times, existing lines are simply shuffled around and may be renamed or otherwise re-branded. If you're searching online and you don't see a specific flooring collection or product featured on Shaw's home page, search for the product on the company's site or through a regular search engine. Chances are, it's still available somewhere on the Shaw site. Floorte is one of the strongest brands among Shaw's luxury vinyl plank offerings. Shaw's key advertising point for Floorte is that it is impervious to moisture through a feature called Lifeguard. This accomplishes two things. First, it makes Floorte a candidate for same-day delivery and installation (flooring made from wood must first acclimate to a room for 48 hours before installation). Second, it means that Floorte can be installed in high-moisture environments, like bathrooms and basements. While most luxury vinyl flooring, not just Floorte, is waterproof, Floorte's Fold-n-Tap joining system does help prevent water from migrating through the seams to subfloors and underlayments. Independent lab tests have shown that a set of casters (of the type used for office chairs) run over Floorte 25,000 times will not result in seam separation. This is important because physical contact is the main way that luxury vinyl plank will separate. Another distinction that Shaw likes to highlight is that Floorte does not telegraph tiling seams from below. Telegraphing means that certain types of thin flooring, vinyl in particular, conform to the ridges and grooves of the flooring or underlayment below. Floorte's 5.5 mm overall thickness qualifies it as one of the thicker luxury vinyl planks produced by Shaw. With an overall product thickness of 6.5 mm and a 20 mil wear layer, Floorte Pro is a premium segment of the main Floorte category. Floorte Pro has a thicker wear layer than ordinary Floorte, making it durable enough for commercial applications. Styles in the Pro series tend to be more high-end, as well, with offerings such as Heritage Oak, Cross-Sawn Pine, and Blue Ridge Pine. Like the main Floorte line, Floorte Pro also minimizes telegraphing because the planks are a bit thicker than those found in other Shaw luxury vinyl projects. But the main difference between Floorte Pro and Floorte (along with other Shaw luxury vinyl products) is the attached acoustical pad. One frequent complaint about resilient flooring is that it feels thin and cold underfoot. Shaw's attached underlayment is the element that makes Floorte Pro one of the thickest luxury vinyl flooring products offered by Shaw. It also provides for a slightly softer footfall and warmer feeling. Premio planks reproduce the look of extremely battered, "rain-struck" wood, as the company literature says. Classico and Premio share the same 6.5 mm total thickness and 20 mil wear layer thickness. Navigator and Aviator lines have the same 3.2 mm total thickness and 2 mil wear layer thickness and are considered mid-range products in terms of quality and cost. Urbanality and World's Fair are two of Shaw's economy-grade luxury vinyl flooring collections within Shaw's mega-collection called Array. True to its name, Array is a large, disparate collection of planks, squares, and rectangles (12-inch by 24-inch products). The common thread is that all Array products tend to fall in the bargain area. Shaw reproduces a few actual faux wood species in the Urbanality line, such as maple and white oak. Urbanality planks resemble a generic non-wood. Shaw calls them "woodlike but [they] don't represent a species." Thus, it's a flooring that can be used in many regions and many different types of homes. World's Fair is a plank-sized, embossed (for texture) resilient product strip measuring 48 inches by 6 inches. World's Fair emulates the appearance of reclaimed wood or barn wood. Premio Fold-n-Tap; beveled 5.83 x 48.03 Premio is at the high end of Shaw&apos;s luxury vinyl plank products and has a weathered, reclaimed-wood look. Classico Fold-n-Tap; microbevel 5.83 x 48.03 Classico emulates basic finished hardwood. Aviator Versalock; square edge 5.9 x 48 Lightly embossed, Aviator is a mid-range floor that represents a basic hardwood look with woods like scraped hickory and oak. Navigator "Locking" (type not specified); square edge 5.9 x 48 Navigator is a square-edge, scraped-style embossed flooring. Easy Street "Locking"; beveled 6 x 48 Large bevel edges give Easy Street (part of the Array series) a realistic look. These are the darker shades and wider grains that have a more down-home appearance. World&apos;s Fair Glue down; square edge 6 x 48 World&apos;s Fair is a collection that offers two different wear layers: 6 mil and 12 mil. Take note that some styles are embossed, and some are not. World&apos;s Fair is a basic, economy luxury vinyl product. Urbanality Glue down; square edge 6 x 36 There is no embossing for this extremely basic commodity type of luxury vinyl flooring. Urbanality comes with either both 6 mil and 12 mil wear layers. With luxury vinyl flooring, total product thickness is critical. It is not that thicker luxury vinyl produces a softer footfall or absorbs sound better. In that respect, all luxury vinyl is essentially the same. But what it does do is allow for deeper and more realistic embossing, beveled edges, and fold-and-lock type of joints. When you get down to those thin 2 mm boards, there is no joint option other than adhesive. Note: One mil is equal to one-thousandth of an inch; "mil" is not short for millimeter.